Agenda Electrical Ltd is a fully qualified, MCS accredited installer of solar electricity(PV) panels.We help clients harness the suns free solar power specialising in domestic and commercial installations. Based in Bury, Manchester we are a family run business offering an honest and reliable service throughout the north west. 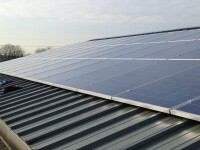 Agenda Electrical Ltd offers a free no obligation on site survey to domestic and commercial premises wishing to cut their carbon emmisions through installing solar panels and benefitting from the feed in tariff. 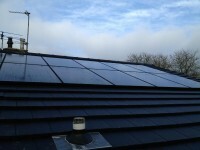 Solar pv wrexham hyundai panels made up this 1.74kwp system in wrexham. 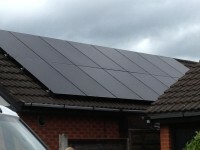 3 kwp solar pv system this installation took place in warrington, cheshire in aug 2012. 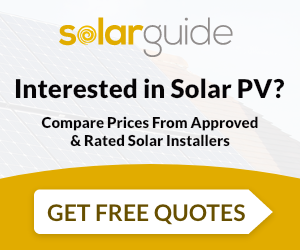 "we would like to say many thanks for an excellent job putting in the solar panel system. we are very pleased with your workmanship and excellent communications with us. also your roofing man & his young assistant did a excellent job in really very wet weather conditions and should be commended.”mrs carter & mr lewis. 4 kwp solar pv system a 4 kwp solar pv system was installed using lg 250w solar panels and a samil inverter in september 2013 in manchester. 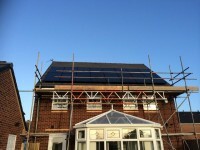 All black 4kwp system in warrington the person who came to my property ( alan armstead ) was the owner of the company and as well as being a qualified electrician he was also the installer of the solar panels . this gave me confidence that he knew what he was talking about and everything he said made sense . he didn't just try and sell me the equipment , he explained how it would be installed ( in detail ) and the technical details of what i could expect from the system . he was punctual on the agreed installation date and work was completed as he had forecast . 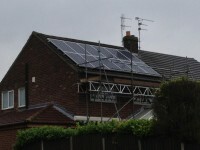 he then went the ' extra mile ' in helping me to complete the paperwork that the british gas feed -in-tariff team requested . i only wish that british gas could get their act together as other companies seem to be able to . as far as agenda electrical are concerned my wife and i are delighted with the installation of our solar panels and would have no reservations in recommending this company to other people . 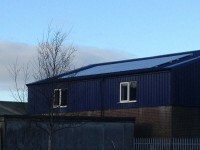 we now need some prolonged sunshine to get the panels really working to their capacity !!!! We are extremely pleased with the installation work by Agenda Electrical. Necessary follow up work has been or is being attended to. Aside from their work I found some Chinese instructions (English translations) difficult to follow - both before and after installation. Alan was extremely knowledgeable and very helpful, not pushy in anyway and an absolute pleasure to deal with. Very neat and tidy workmanship also. Thank you for your feedback. I hope you get plenty of sunshine this year. I am very pleased with the work carried out by Agenda Electrical. The work was carried out to my requirements, quickly, neatly and at a very comparable price. Very prompt response to enquiry. Survey arranged quickly and done by owner (Alan). Extremely professional approach, listened to our preferences, answered lots of questions we had quickly. Discussed and was able to offer more than one option for panel manufacturers, inverter location etc. Quotation was fully detailed down to the exact type of mounting hardware used to connect the mounting rails to the roof. This raised more questions all of which were answered promptly. They worked with us to refine the final specification (UK assembled panels, networked inverter, networked remote output monitor and stainless steel mounting hardware)and still be competitive with others "standard" offerings. Thank you Mr Middleton for your detailed feedback. This man knew what he talking about, how to do it properly to a high standard and did indeed do that. Thank you for the kind words, we do aim to please. The person who came to my Property ( Allan Armstead ) was the Owner of the Company and as well as being a qualified Electrician he was also the installer of the Solar Panels . This gave me confidence that he knew what he was talking about and everything he said made sense . He didn't just try and sell me the equipment , he explained how it would be installed ( in detail ) and the Technical Details of what I could expect from the System . He was punctual on the agreed installation date and work was completed as he had forecast . 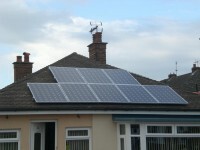 He then went the ' extra mile ' in helping me to complete the paperwork that the British Gas Feed -in-Tariff Team requested . I only wish that British Gas could get their act together as other Companies seem to be able to . As far as Agenda Electrical are concerned my wife and I are delighted with the installation of our Solar Panels and would have no reservations in recommending this Company to other people . 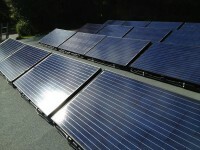 We now need some prolonged sunshine to get the panels really working to their capacity !!!! Thank you for the feedback it is very much appreciated. Very quick initial response. Rang within 15 minutes after inputting details on Solarguide website. Didn't try to sell a bigger system than was requested (unlike other quotes). Workmanship looks good. In total took 13 days from quote to commissioning, no hidden charges or delays. Very pleased. Thank Mr Wallbank for the great feedback. Thank you for the lovely coffee and I hope you will have many years of good sunshine. Agenda Electrical were pleasant and helpful. The quote was very competitive. They offered a professional and prompt service and communicated well. Alan (Director) was quick to call for a quote, and discuss options, and prices. He was extremely friendly and helpful, answering any questions. Time taken from quote to installation was amazing (17 days) excellent ! I was very happy with estimat,but with Government shock reduction of feed in tariff I didn't have time to wait,so Agenda certily got cracking. Very professional and carried out work well. Company turned up on the due day and installed the equipment. All packaging removedfrom site. 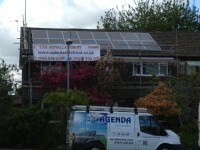 Agenda Electrical Ltd are MCS accredited engineers who supply and install Solar PV. 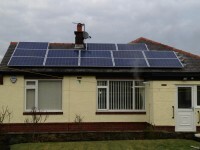 For similar installers in this area please visit the Manchester solar page.